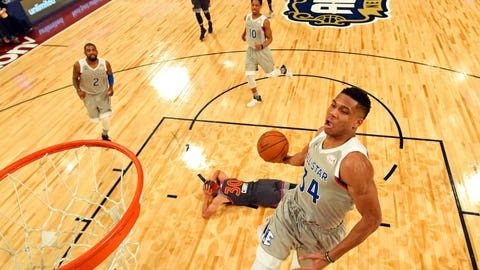 NEW ORLEANS (AP) — It was the fourth quarter of the All-Star Game, and a few fans started yelling loudly enough for DeAndre Jordan to hear them from his spot on the Western Conference bench. The moment was both hilarious and fitting. Defense was in short supply on Sunday night during the NBA’s showcase game, one where Anthony Davis smashed a 55-year-old record with 52 points and the Western Conference beat the Eastern Conference 192-182. And it prompted some questions afterward on whether the glorified exhibition really needs to see at least the appearance of defense return. There were 33 steals in the game, sure, but most of those were the byproduct of bad passes than picked pockets. There were 16 fouls, mainly ones players were taking to stop the clock and allow substitutions; only four were of the shooting variety. Stephen Curry laid down on the court at one point while Giannis Antetokounmpo was driving in for what became one of his 12 dunks. Davis took 39 shots, making 26, both of those now All-Star records. The game also established records for total points (384), most field goals (162), most assists (103), most assists by one team (West with 60), most points in one quarter (101, first) and so on. The East set a rather dubious record, establishing a new high score by a losing team for the third consecutive season. Put simply, it’s not a real game, and real-game thinking doesn’t apply. LeBron James made a shot from nearly half-court, something he would never try in a competitive situation. He loves defense. He wasn’t missing it on Sunday. West coach Steve Kerr said he and East coach Brad Stevens had jobs on Sunday night akin to the person who played the role of the title character in “Weekend at Bernie’s,” that being a deceased man who gets dragged from place to place and propped up to somehow give others the illusion that he’s still actually alive. Kerr’s point: How All-Star games are played isn’t up to the coaches, but rather it’ll be the players who decide if they want defense back. East guard Kyrie Irving expects that the game will change. Like many, he said avoiding injury in the All-Star Game is paramount and that’s certainly understandable. But he also expressed a wish that the games had a bit more of a competitive aspect. “I think going forward, the All-Star experience will probably get a little harder in terms of defense,” Irving said. Down the stretch, the East did apparently try to raise the defensive bar. Stevens said it was discussed in the fourth quarter, with hopes of putting the East in position to win the game. He almost sounded disappointed in how the flow went.